Belly Dance Classes and performances. Egyptian, Lebanese, and Persian styles of Middle Eastern Dance. Belly Dance classes for Beginners to Advanced. Private lessons and coaching. Professional glamorous belly dancers for hire for corporate events, parties, weddings and ladies parties. Our annual event that showcases Middle Eastern dance and has featured professional dancers from around the world. Theresa Maze performing in Ukraine at Al Hayat festival 2018. Theresa is an international bellydance artist, she has served as a competition judge and performed in Egypt, Lebanon, Italy, Mexico, Ukraine, Japan, and across the USA. Theresa teaches belly dance and enjoys sharing her experience and knowledge with belly dance enthusiasts of all levels. Her teaching style is encouraging, passionate and energetic. She brings a playful attitude to teaching that makes learning fun. 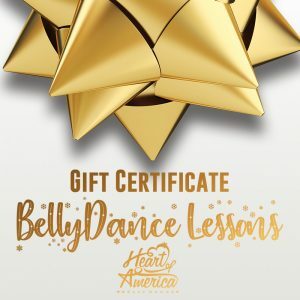 Belly Dance Lessons, a great Holiday Gift idea! Includes a customized gift certificate.